The striking Moby Kiss can carry up to for 1450 passengers and 420 vehicles on each of its journeys. Refurbished in 2015 the ship is decorated with Looney Toons livery on its exterior, making an ideal ship to take the family on. Moving inside the ship you’ll find a wide range of amenities. A wide range of food options are available with a bar, coffee shop, self-service restaurant and even an ice cream parlour. Extra features include totem charging stations for your smartphones, on board Wi-Fi and satellite television. For the younger travellers there is a video games room and children’s area. A kennel is available for pets, meaning all shapes and sizes of travellers are catered for. Travelling in complete comfort won’t be a problem on board the Kiss. Your reserved seats are numbered so you don’t have to search for an empty spot. The armchairs recline to satisfy your needs and for extra comfort you are provided with a footrest. The seating options are situated in special large saloons with TV sets and air conditioning. You will be spoilt for choice when it comes to catering options on this state of the art vessel. If you fancy a light snack or a little treat, head to the ice cream parlour. If you are seeking a more hearty meal you can choose from a wide array of freshly cooked meals in the self service restaurant area, with meal options for both adults and kids alike. It will be easy to relax on your journey with big screens showing satellite TV. On top of that, you won’t be cut off from the outside with Wi-Fi access and on board totem charging stations to charge your smartphones. There’s no need to leave your four legged friends at home during your trip as kennels are provided to look after your domestic pets. A designated children’s area is provided so the little ones will be kept occupied on their voyage. Here you’ll find a video games room as well as a play area. 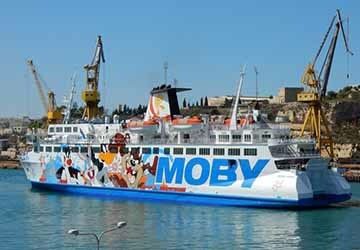 Please Note: Whilst we have taken great care in making our Moby Kiss guide as accurate as possible, onboard facilities, services and entertainment may vary depending on the date and time of year that you travel, facilities mentioned may change without notification and ferry companies reserve the right to operate vessels other than those mentioned at time of booking without prior notification.